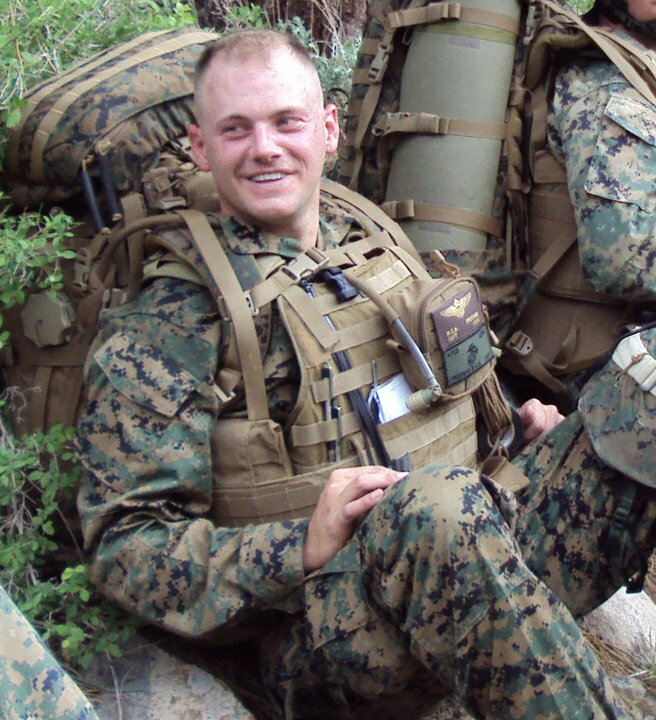 This man was killed in the Shpee Valley, Kapisa Province, Afghanistan, on August 7th 2009. I was on the mission where he was killed. I didn’t know him. I saw him during a rehearsal before an attack. The next time I saw him, the following morning, he was dead. Two other soldiers and I were almost shot recovering his body. His name was Matthew Freeman. He was a Marine Corps Captain, a Naval Academy graduate and C-130 pilot who was doing his time on the ground as a forward observer. He had only been in Afghanistan 18 days when he was killed, and was married less than a month earlier. He advanced into a known Taliban stronghold with a Georgia National Guard Embedded Training Team and a handful of Afghan soldiers. They knew they were going to be ambushed. The first bursts of enemy fire killed three Afghan soldiers and wounded another. 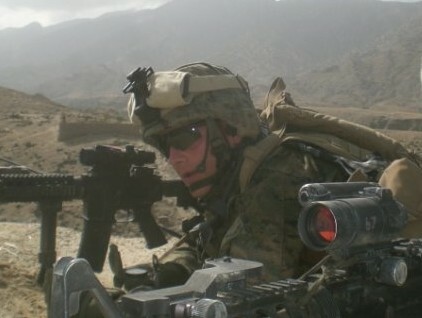 Captain Freeman and several other troops rushed to a compound, an Afghan home, and cleared it. Captain Freeman and a Georgia medic climbed onto the roof of the compound so Freeman could direct fire support onto enemy positions. As he was engaging with his carbine and calling for support, Captain Freeman was shot and killed. The medic beside him was almost hit, and as he scrambled off the roof another Georgia soldier was shot trying to help him. This picture of Captain Freeman was taken just before he was killed. In the end, we were ordered to recover our casualties and retreat from the valley. Even though I didn’t know Captain Freeman, his death affected me more than any other experience I had at war. A few days after the fight, alone in a dark room, I cried over the tragedy of his promising young life lost, the frustrating conclusion of the battle, and the angry feeling that he had died for no good cause, in a valley nobody would ever hear of, for people who didn’t want us there. It took me years to realize that he didn’t die for those people. He died for his people, both those beside him and those back home. His brave death wasn’t for Afghanistan, it was for America. And whatever the end result of our effort that day, one objective truth remains: Captain Freeman believed in himself, his comrades and his country so strongly, he willingly risked, and lost, his life in defense of our values. In 25 years in the military, I’ve done many things. But nothing else I’ve done was as important as the small role I played in bringing Captain Freeman home. Today isn’t my day. I lived. Today isn’t every surviving veteran’s day. They lived too. Today belongs to Captain Matthew Freeman. Happy Memorial Day. Great tribute Chris, very touching. It’s slightly upsetting to me that many people seem to forget that this is what Memorial day is about, not just “all serving, present and past”. That’s veterans day, today is about remembering those like capt Freeman, who paid the ultimate price. Yeah, and I feel kind of bad complaining about people who confuse the two. It’s good to feel appreciated, but hey, we living veterans already have our day. It grieves me not only today, but any day I think about it, and moreso when I visit Ft. Logan National Cemetery to remember my Dad, that so many still don’t “get” what you concluded/summarized very well: “It took me years to realize that he didn’t die for those people. He died for his people, both those beside him and those back home. His brave death wasn’t for Afghanistan, it was for America. And whatever the end result of our effort that day, one objective truth remains: Captain Freeman believed in himself, his comrades and his country so strongly, he willingly risked, and lost, his life in defense of our values.” Values. These folks refuse to understand that the sole reason they can say, do and choose their thoughts and actions, boils down to those who gave their life (or some amount of time out of their life) for the United States of America. Thank you Sally. For your comment, and your father’s service. Beautiful words Chris, well said. Today is for the fallen and for those of us who did come home to remember. Thanks Sarge. Happy Memorial Day to you. Thank you for taking time to read about Captain Freeman. He went down swinging, all right. There is no higher honor for a Marine. What a tragedy, but what a heroic death. Thanks for remembering, and thanks for being there. Thanks for having our backs and letting us get into the fight, SGM. We were lucky that our chain of command didn’t panic and keep us inside the wire. The day was lost Captain Freeman was a shifty day, but not being there would have been worse. Capt. Freeman was my roommate at Camp Blackhorse and was actually a very funny guy, you would have liked him Chris. Thank you for taking care of him. Happy to do it, sir. Hope you’re doing well. Thank you for sharing this story Chris. I am from Richmond Hill Georgia where Captain Freeman grew up and knew him and his wife. He was a great man with a great family and is a true American hero. Thank you for your service and keeping his memory alive. Thank you, Clay. You’re doing a great service yourself, just by keeping his memory alive. Thank you, Carrie. Never forget. Words can’t describe this day; it seems like yesterday! It was the first time I sat my baby girl down and explained how great some people are and their sacrifice for all of us! !Though we weren’t best of friends in middle or high school he had a beautiful smile for everyone! Made us laugh in the hallways and Paruso’s French class! He helped me pass that class by teaching me the “bad words”…he is the Ultimate hero!!! So proud of our hometown for honoring him and continuing to support his family and friends! RIP Matt!! You will always be remembered for the hero that you are!!! Very well written tribute Chris. I looked out towards Spee quite a few times from Tagab in 2011. It may not be heard of as much as the Korengal valley, but I talk about that area to whomever will listen. CPT Freeman’s story will now be added to it when I talk to people. This really does seem like yesterday, I can’t believe it’s already been 5 years. I still remember where I was when my Dad called me. Matt’s mom is my father’s cousin, and even with a distant relationship like that, our families kept in touch through the years. My sister used to spend time with Matt while he was attending the Naval Academy. We were there when Matt was interned. His memory is not forgotten and I am so proud to call him family. Thank you for writing this piece. It gives comfort to hear from the people who were with him during this fight. Thanks, Chris. As a kid Matt was in our home often. Everyone here was crushed to the core when we heard the news. I’m sure I speak for everyone who knew him that you have our deepest appreciation for taking care of our ‘boy’ and giving us this marvelous remembrance. The one perfect word to describe Matthew; wonderful. Simply wonderful. I’d give anything to see him one more time, but the memories of the good times we had will do until we meet again. My sons will know his name (we named one of them after him) and their sons shall too. Thank you for being there for my friend, you too would have called him brother. Having read about Capt Freeman a few months ago, I have been thinking about him and what you wrote for a while. You hit the nail on the head…it’s not the Shpee Valley residents that will remember Capt Freeman…it’s you VOLUNTEERS who fought with him that will remember him. It’s our system of government (as crazy as it is) that makes free people appreciate what they have and then want to FIGHT for it in the places our civilian leaders send us. Every death is a tragedy and a loss of the promise of a young vibrant life, but…we still get volunteers. I will certainly be remembering Capt Matthew Freeman, in addition to Maj Walter D. Gray every Memorial Day. Maj Gray was an Air Liaison Officer attached to 4/4 at Jalalabad. I met and spoke with him a few times “out yonder” and he was a genuinely good man…you could tell just by talking with him. I cannot fathom the loss that his family must feel, even two years later. Thanks Chris…for all you did and still do. Matt was a close friend. I was not there at the time of his death, but read about it on SIPR the day after while I was in Iraq. If you have time, I’d request that the author shoot me an email at ies11@yahoo.com. Thank you for this amazing tribute. Matt turned me on to so many things. My favorite series of books comes from him letting me borrow a few after I rode my bike some ten miles to hang out with him. That’s the guy I remember… a guy who loved literature. He wasn’t just s soldier, he was a very learned man and a romantic to boot. He was also the truest of nerds, and really inspired me not to be ashamed of my love of stuff like D&D. That’s the kind of thing I remember the most… how he had this way of making the people around him feel more secure. I certainly feel more secure for knowing him, because he never passed judgement on your walk of life or whatever social hangups you had. He would find a way to insist the two of you were equals. That is why he has touched so many lives. Matt was on my Embedded Training Team. He was killed as a part of our advon and most of the team was not in country yet. I heard about his death on the morning of our departure. His death effected our team greatly. He was the glue that kept the team together. Nothing would have given us more pleasure than to take the fight back to the Taliban in Kapisa. Unfortunately we were not given the chance as we swapped with a French OMLT in Wardak. I want to thank you for remembering him and for risking your life to bring my brother home. Really powerful stuff. It’s shocking how backwards we are as a society lifting up morons and rappers while overseeing the real heroes amongst us. Thanks for sharing this Chris. You did good.